Shine a “lite” on this: There’s a brand of lower fat mayonnaise that actually tastes like the real thing. It’s Duke’s, which rules in the South the way Best Foods rules here. You have to mail-order it, but that’s not too onerous if you split up the order between friends. Great gift for a friend who is dieting or health-conscious. A pack of four 32-ounce jars of Duke’s Light is $14.71 marked down from $18.59 on Amazon.com right now; you can get free shipping, too. 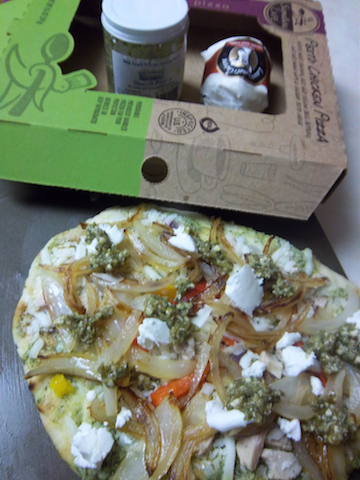 Safeway artisan pizza, with a little help from yours truly. Yum! Pizza for one or two: I’m not much for prepared foods or a huge fan of grocery store delis but Safeway’s Signature Cafe Rustic Style pizzas are pretty darned good stuff, especially at $4.99. (Have you ordered a pizza lately? Sticker shock!). The only thing truly rustic about these is that they’re not round, but hand shaped into odd oblongs. But the toppings (Pesto Chicken, Six Cheese, Veggie) are good and they’re just the right size for one medium eater or two lighter eaters. I always “doctor” them anyway, with goat cheese or marinated artichoke hearts or Kalamata olives or something. And I don’t follow package directions: I heat up my pizza stone at 500 degrees and pop them onto that; since they’re fully cooked anyway, they’re done in five minutes. Saturday night: Sauteed onions for Husband, goat cheese for me. More on pizza: I enjoy cold pizza for breakfast as much as the next guy but hate to spend $20 on a pizza and watch the leftovers go soggy if I don’t happen to be in a pizza in the a.m. mood. I went into mourning when Pizza Hut stopped doing their individual pizzas; they had a Thai chicken, I think it was, that wasn’t bad. And DOES ANYONE KNOW: Is there anyplace in Honolulu to buy fresh, raw, shaped pizza dough? My K-Cup garden; the first row is my smuggled-in Venetian arugula. A mini mini-garden: Every time I pop another K-Cup into my single-serving Keurig coffeemaker, I feel a bit guilty — all that packaging in the trash. I avoided using the thing until they began marketing the attachment that allows you to use your own ground coffee. However, spoiled brat that I am, I found that arrangement a hassle and allowed myself to be wooed back to the prefilled cups. 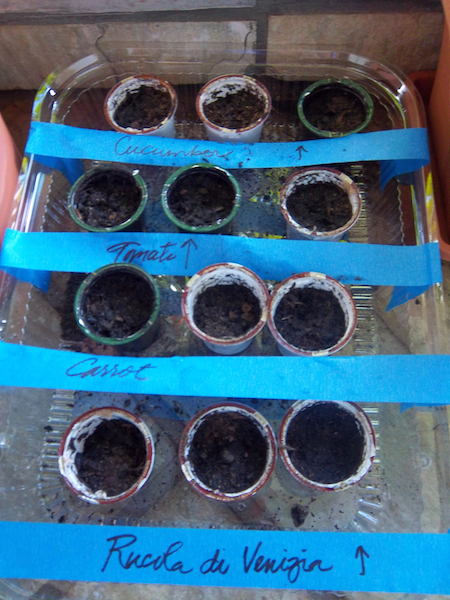 Doing a story about home gardening for The Honolulu Weekly, I got an idea: a K-Cup garden. So I saved up my empty cups, which are already conveniently pierced at the bottom when you use them, filled them with organic potting soil and added a few seeds to each. That was Wednesday and the cucumber has already sprouted! 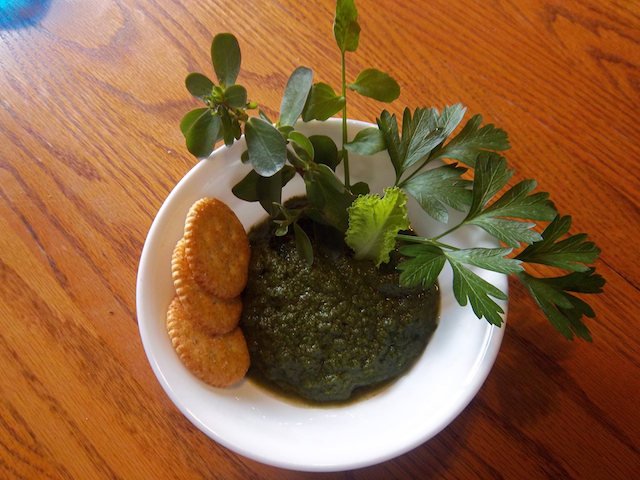 Tony's Green Goo: Purslane, watercress, Portuguese cabbage and parsley on a Ritz, a Superbowl invention that has potential. Here’s what I think I’ll do: Add some calories. I’ll use the same lineup — Portuguese cabbage (you could use collard greens or kale but I’d blanch them first), parsley, watercress and purslane (a succulent ground cover that’s ridiculously easy to grow but if you don’t have any, don’t worry about it) — a container of concentrated chicken broth (the one chef Marco is advertising on TV) instead of water, and a modest amount of something creamy (chevre, cream cheese, mayo, creme fraiche, mascarpone). Still a lot better for you than most dips. Have you made any food discoveries lately that you’d like to share? Practically every Friday night in our home is pizza night. Some of our favorites are a BBQ cieckhn pizza, sausage and banana peppers, and my most recent favorite… caramelized onion and pear. So good!I had kind of given up on making my own dough (I was using store bought crusts) until I found Pioneer Woman’s recipe. It is by far the best recipe in my opinion. Your pizza looks delicious!! !